The National Society meets in biennial conventions for the purpose of governance, fellowship, and scientific exchange. 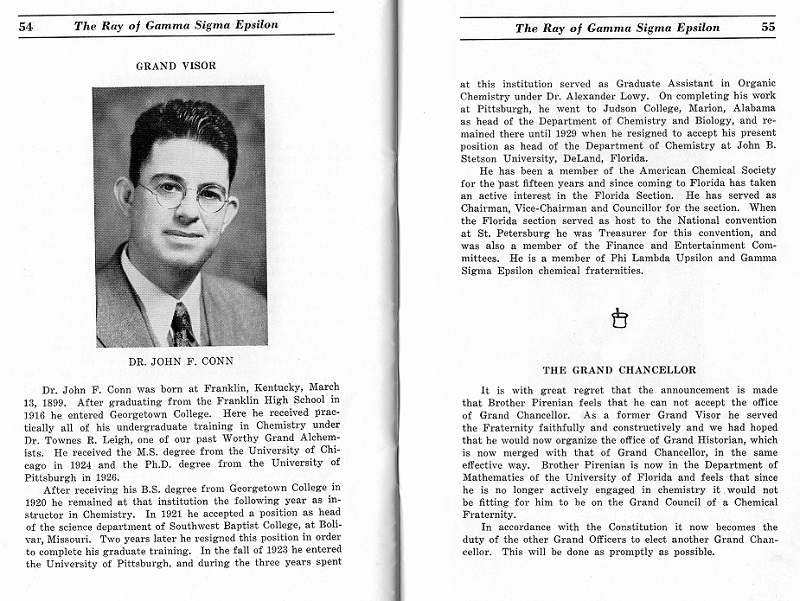 Each Gamma Sigma Epsilon member presenting a research poster at the biennial convention receives the $50 John F. Conn Award and the outstanding poster presentation receives the W. Allan Powell award and an additional $100. A special chapter award of $200 is presented to the "Outstanding Chapter" whose activities are documented by a poster presentation. The DeLap-Holcomb scholarship of $200 and the Roy W. Sonntag award of $100 are given at the local level annually at the discretion of the local chapter advisor to a worthy junior or senior chemistry major. Local chapters may also apply for a special project award of up to $500 based on a proposal submitted to the Executive Council. This proposal must include a statement of purpose for the project, an execution plan and proposed expenses equal to the requested amount. Local chapters may receive one special project award each academic year. A project report must be submitted to the Executive Committee. Any future awards are contingent upon successful completion of the project and reporting this information to the Committee.